the swarm and a rumpelstiltskin jig. Today was going to be a quiet day - a day to clean, hang out, and be generally pretty lazy. After the last few weeks of madness, we needed a boring day. So, just after noon, we headed to the farm to feed the chickens our juice-making scraps. We didn't expect to see anyone there, but, as all "my day started out so lazy..." stories go, we were wrong. We did see someone. In fact, three someones - Abby Baxter, her son (the cutest little thing you ever did see), and a friend of theirs. I probably need to insert here that Abby and her family are beekeepers. And not just any beekeepers - rad ones. Beekeepers that have lived on a bee sanctuary and keep the bee's best interests in mind at all times. In a nutshell - the kind of beekeepers we could use a little more of around these parts. Yep, that's what I thought too. Turns out this mass of bees hanging on the bottom of my largest hive was a swarm. As in new, free bees in need of a home. These puppies had come from who-knows-where and placed themselves so sweetly and conveniently at the "feet" of another hive. Abby comes up to the hives and we start talking about this swarm. She graciously says she'll go pick up her husband, Greg, to capture the swarm and put in a new hive box for us. Greg, as calm as the calmest of all calm cucumbers, dipped his hand in that mass of bees (we're talking around 20,000 bees), scooped them up like ice cream, then (again, calmly) dropped them into their new home. This process took over two hours! Poor Greg was dripping sweat from his face, but diligently and oh-so-patiently sticking to the task at hand. He was determined to re-home those bees before they flew off elsewhere. Just before the heavens opened up and pure craziness ensued, Greg and Abby decided it was a good idea for everyone to back up and allow the bees some space. The reason? To see if the queen had been moved into the new box. If she had, the remaining bees from the swarm would slowly migrate to the box. If she was still under the hive, the bees would head back out of the box to be with the royalty. The rain came and we all gathered under the canopy to watch what would happen - would the swarm get all comfy in their new home or insist on being under the old hive? He went to his truck and brought back a wooden box drum with a handle. He sat beside the hives and beat on the drum for a few minutes. The cloud of bees started moving. With each beat of the drum, the bees seemed to settle. Darn! 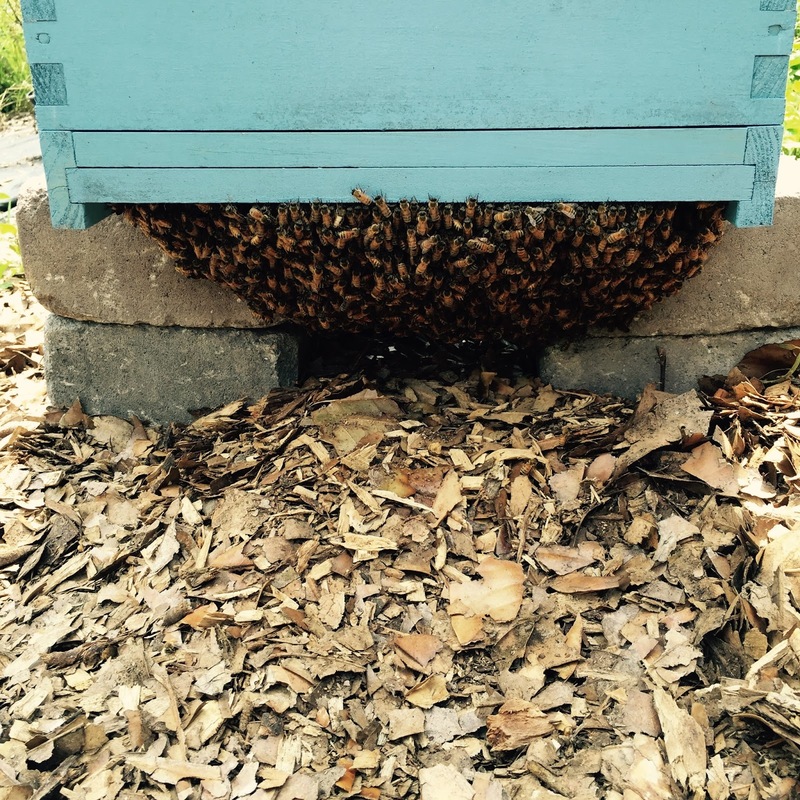 They were going right back under the old hive. Even though they hadn't yet become cozy in their new home, at least they weren't taking off elsewhere (which was the fear). 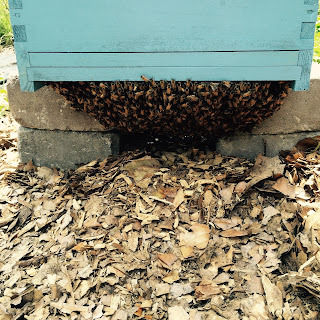 Slowly but surely, the bees returned under the old hive. No worries, though. Greg had a plan. He and my husband, J, would simply lift the old hive, exposing the mesh bottom board that the swarm was attached to, then shake that mesh bottom board off into the new hive. That sounded fantastic to us. But here's where things went a little awry. When Greg asked J for help, what I should have said was something like this, "How about I help you do that?" Those seven words would have changed this story drastically. But then it wouldn't have been so good. So confusing. So painful. I'm going to set the rest of the story up like this: J is a pretty cool, calm and collected kinda guy. He has shoulder-length blonde hair and (nearly every day) wears khaki shorts, flip-flops and a white t-shirt. So when Greg asked J to help pick up an entire hive, he was down with it, man. Should we have mentioned that J didn't have gloves? Or that is legs were just so exposed? Or that his surfer dude hair was fabulously whispy? Or maybe that he had never even touched a beehive? YES. But, alas...we did not. Instead, J (a little apprehensively, I might say) grabbed one side of the hive and Greg had the other. Both bare handed. And bare faced. As they lifted the hive, I hear a tiny mumble come from J. It sounded like, "I don't have it..."
And just like that, WHAP! The hive crashed to the ground. And those bees went nutty. They were furious! At that moment, I was trying to process what the heck had just happened. It had all been so calm and quiet until now. But my brain wasn't fast enough. I saw and heard it all...but I was so confused. And what do I do when I'm confused? I laugh. Then J screams, "WHAT DO I DO?!" And I realize what's going on...he's getting LIT UP by those bees! Boy does he! He first ran to one side of the field; yelping and jumping with each sting. Then he stopped running for a second, only to realize just how many bees were still on his body. A second later, after taking a sting to the lip, he starts violently head-banging; trying desperately to get a bee from his aforementioned whispy hair. Then came the run to the other side of the field. On the way, J dropped any (and all) dignity that may have remained. With his last sprint across the field, he was a hopping and a bopping while yelling and stripping every stitch of clothing off (minus his underroos, of course) until he got to the water spigot. There, J doused himself as I picked out the stingers left behind. After a couple of minutes, we realized how thankful we were that he wasn't allergic! Soon everything calmed down and we look over to see that Greg had somehow turned the hive back upright and had transferred the swarm to their new home. He was like Houdini. I still don't know how he did it. One minute: panic. The next: tah dah! Done. With both guys having been stung a several times, the minute or so of craziness probably felt like an eternity... But hey, you live and you learn. So here was the take-away: honey bees are calm creatures unless you pick up their home and throw it to the ground...then you better RUN like the dickens! I woke up yesterday to find a sickly chick in the coop. When I'd locked them up the night before, she'd been fine. But yesterday, she definitely wasn't. She was barely picking at the grass, somewhat wobbly on her feet, and not able to keep up with the rest of the chickens. 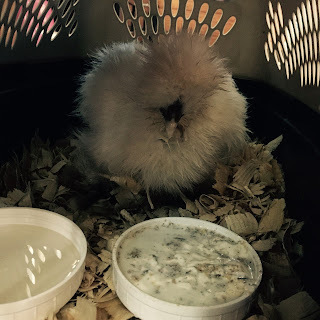 I was worried, so I did what any good Chicken Momma would do, of course - researched what her ailment could be and how we'd go about getting her to feeling better. After a little research, I'd found my first line of defense. I followed the directions and she seemed to perk up a bit. Thank goodness, I thought. A couple more doses and she might be flying high. I had thought about bringing her home with me last night, but since she seemed somewhat improved (and I couldn't stand the idea of stressing the poor thing out more! ), so I left her there. When I woke up this morning and went to let the chickens out of the coop, there she was; listless and pitiful. My heart sank. I scooped her up and brought her home. I'd read that it's a good thing to get them nice and warm, so I did what any good Chicken Momma also would do - I turned on the fireplace and we got warm together. I gave her some good food and water and her own little place to rest. I immediately felt a little relief, as she gently dipped her beak in the food-slurry-mixture and took a drink. She did that a few times, so I thought this may be the ticket to a healthy chicken. Throughout the day, she seemed alright. Then, tonight...I checked on her and she was sleeping. But not an I'm feeling so much better sleep. She was sleeping like it was almost time. Her time. To go. I scooped her up in a towel and took her outside. I tried one more time to get her to drink. With a syringe of water in one hand and tears streaming down my face, she looked up at me one last time and passed away right in my arms. I've never had anything like that happen before. It was so easy for her to just drift away, and so hard for me to process it all. And as I think about death being such a reality on a farm, I'm not sure it's something my heart is ready for. Just thinking about it gets those tears flowing all over again. So what? She's just a chicken. You might think. But she wasn't just a chicken. She was our chicken. And that makes her part of our family. Nobody want to lose a piece of their family. So, I did it. I caved. I had told myself that we could not get chickens until we live on the farm. Then, one day, I decided I could have chickens. You know, if I wanted to. And then, as if I was afraid I'd take back the permission I'd given myself to move forward with my chick-y shenanigans, I called a breeder almost instantly. 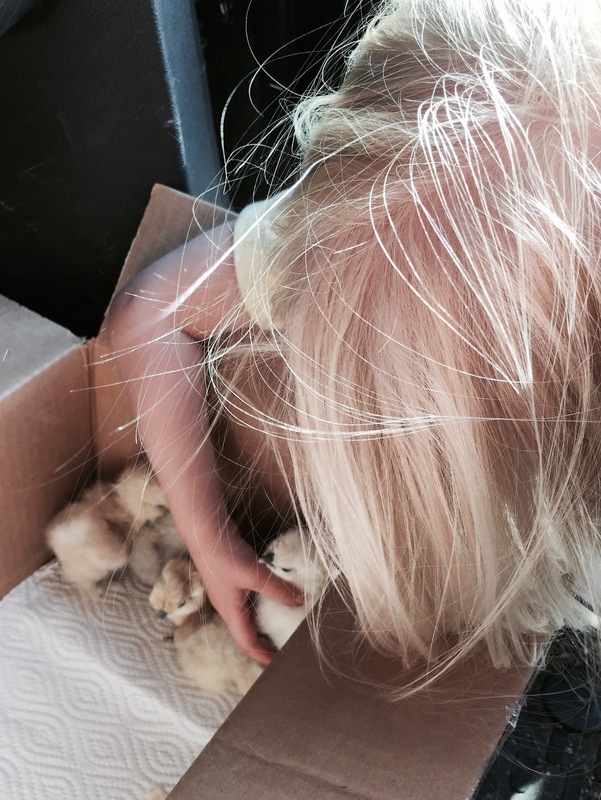 Within minutes, we were on our way to pick up our new feathered friends just one county over. Was this a hasty decision, you ask? Yes'm. What was I going to feed them? See! Now here, I do have an answer... You see, I had felt this bird fever coming on, so I had ordered some mighty fine chicken feed. You know, just incase. And what the heck were my long-term chicken goals? To have them, and hold them, and keep them forever. ;) Truthfully, I'll have to give you another "I dunno," complete with shoulder shrug. And, let me just tell you, I don't know who was actually more excited about our new family members - me or my little lady. She has loved on those chicks daily! She's introduced them to the back of her dump truck, picked zillions of flowers to give to them, and even helped with the chicken chores. She is in hog (err, chicken) heaven! And speaking of my little lady - we named each of the chicks after words she said as a baby/toddler that may or may not have had a real meaning, but she said often. Ready for their names? Putico, Shluey, Chowpangy, Blowey, and Westerday. The only problem is they've all turned out to be perfectly and unchangingly white.